I have always been a believer in the power of the word. I’m am constantly trying to get my daughters to talk to each other with love, even when they are at each others throats. So when I came across an article about the scientific proof that words can alter the physical world around us, I took notice. It was a simple experiment conducted by a researcher and alternative healer from Japan, Dr. Masaru Emoto. He added water to three jars of rice and said “thank you” to the first jar, “you fool” to the second jar, and ignored the third. The results were amazing. After 30 days, the rice that was told “Thank you” was barely changed, while the others grew rotten. With much skepticism, I decided to try this experiment at home with my daughters, Chickenhawk (age 6) and Ms. Prissy (age 8). I simplified the process by splitting ½ a cup of boiled rice (in water) and evenly distributed them between two identical jars. 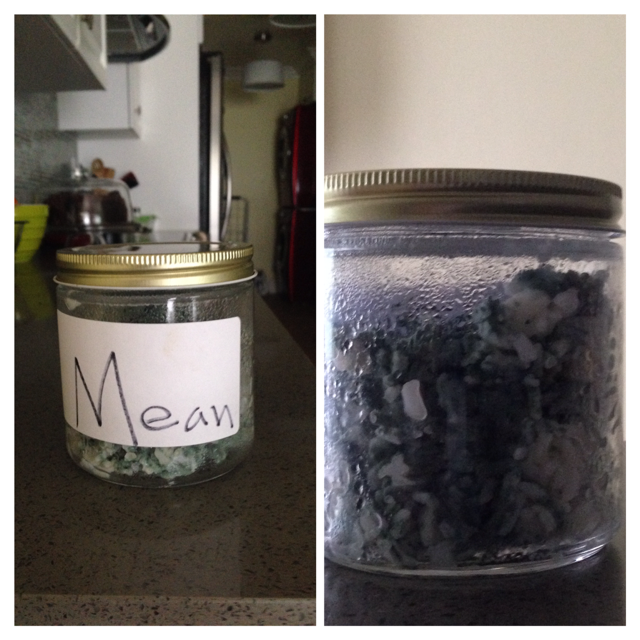 I wrote the word “mean” on one jar and “nice” on the other. I then instructed the girls to say cruel words to “the mean jar” and say kind words to “the nice jar”. I placed them across from each other on the counters with equal lighting. At first I would have to remind the girls to talk to the rice. Then we all got into it. Throughout the day I would pick up the “nice rice”, hug the jar and tell it “I love you.” I would witness Ms. Prissy periodically telling the mean rice “I hate you.” Then she would step over to the nice rice and say “you are so sweet.” And my little Chickenhawk really got into the game. One day she asked me to walk over to the rice with her. “The f-word” she whispered excited at the thought of having an excused reason to say that forbidden word. “Well, can I do THIS to the rice!” She scrunched her face and failed in her attempt to give the rice jar “the finger” as she held up her single pinkie finger. “OK, I’ll say the second worst thing. YOU ARE STUPID!” She shouted and ran off. After a week of all this schizophrenic/ inappropriate behavior in my kitchen, the results were quiet unbelievable. 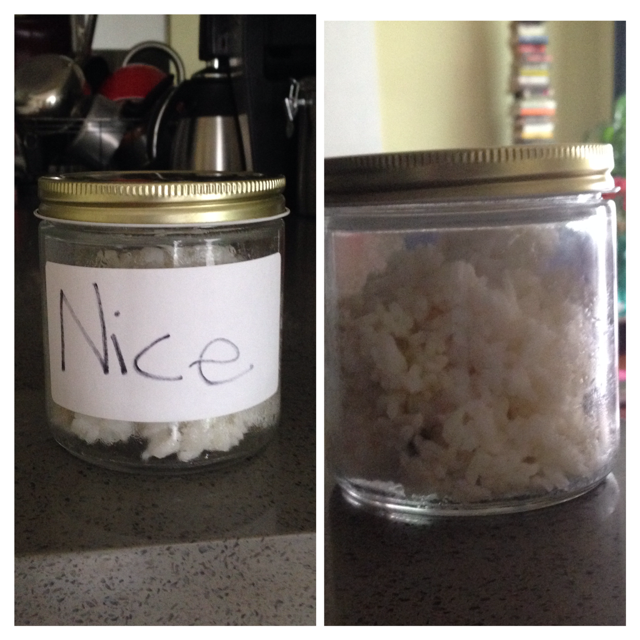 A green mold had overtaken the “mean” jar of rice and the “nice” rice had very little change. Now, I am a true believer. The idea that our mind can heal our bodies and that there is power in prayer really makes much more sense to me now. When people say hurtful things, maybe its hard “to get over it.” Words can penetrate beyond an emotional level, making the act of forgiving sometimes so challenging . At the same time, extending kindness and saying thank you can really make a difference in our every day lives. I don’t know the long lasting impact this is going to have on my family, but lately I have overheard new phrases being shouted out beyond the walls of my daughters’ room. A few times when my husband and I have had conversations that grew a little “sharp,” I have randomly interjected, “remember the rice.” Then we quickly change the course and tone of our conversation. I hope with this upcoming Valentine’s day we all begin to extend the sentiment of love past the 14th. Let’s tell our families we love them everyday and let our friends know how much we appreciate them more often. Most importantly let’s be selective with our words, and remember the rice! Please try this at home with your family, your friends and loved ones. wow! I knew this result with individuals and how important words are. But the dramatic change of the rice is amazing. Calida, thanks, just affirmation of what the Bible teaches us. Thank you Calida. I can’t wait to share this with the families at From the Heart! It would be a great experiment to do with the kids! Glad you liked! This is brilliant! I sent your link to Alex to try with his kids at school. The “rice game” is an amazing little story! Kids aren’t the only ones who can learn from it. Will definitely pass it along! Thanks Calida for sharing this we will be doing this experiment on our home!